Inside diameter: This is the minimum inner diameter of the bellows. Outside diameter: This is the minimum outer diameter of the bellows. Free length: This is the unloaded length of the bellows along the convolutions. Spring rate: This is the spring force that the bellows applies. 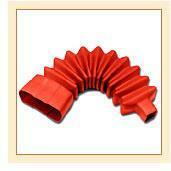 Shapes: The common shape or profile of rubber bellows includes round and square or rectangular. Cryogenic rated bellow: They are used in cryogenic systems to handle very low temperature gases. Flange: This is a fitting, used to attach the bellows to equipment or piping. Hermetic sealing: Hermetic sealing on these bellows is used in high and low pressure applications. It is used in liquid or gaseous media. Medically rated: It is used to insure a high degree of sanitation. Vacuum rated: This includes any vacuum application to very high vacuum. These Bellows are normally used as covers on parts which needs protection from dust. These Bellows are of flexible types and have a good cushioning properties. They are of different shapes and types depending upon the fitment application.